Whoever coming to Vietnam travel and most Southeast Asian countries (such as Thailand, Laos, Cambodia) is much fond of a special condiment – Fish sauce (or nuoc mam in Vietnamese). It is a staple ingredient of numerous food like curry and sauces, and is derived from fish that is allowed to ferment. 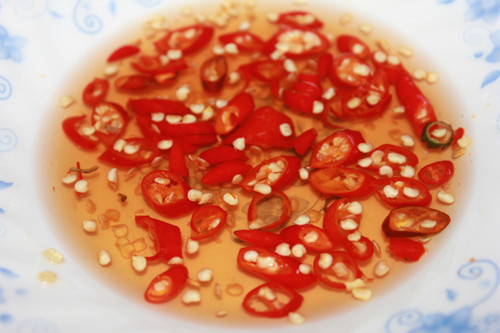 The origin of fish sauce in Vietnam dates back to ancient times as a primary source of protein. Early fishing boats were unable to venture into the deep ocean to catch larger fish for more fish meat. Instead, they mostly stayed close to the shore and net small fish. Later on, it was found that they could produce a richer protein sauce by layering these small fish in barrels with salt. Since then, there appeared such a delicious sauce! Ingredients and production process: Only the fresh small fish makes good-quality fish sauce, which is found in clear color and good smell. In Vietnam, fish sauce is very popular and can be any of various mixtures based on the liquid of salted, fermented fish. First, small fish and salt are put in wooden boxes to ferment. Then, it is slowly pressed so as to yield the salty, fishy liquid. This extremely pungent, strong-flavored and salty liquid can range in color. For the pure fish sauce, fresh anchovy fish sauce is selected and mixed with salt by applying the unique Vietnamese traditional process. Fermentation is started once a year, during the fishing season. After about 3 months in the barrel, the liquid drips from an open spigot, to be poured back into the top of the barrel. Six months under the sunlight will make the fish sauce of much better smell. The unique characteristic of fish sauce is salty flavor and fishy smell. An interesting characteristic of fish sauce is that it loses its fishy odor once mixed with other ingredients. It is commonly used for cooking and dipping seafood and many other Vietnamese foods as well. In Vietnam, it is generally called nước mắm (well known by these brand names: nước mắm Phu Quoc or Phu Quoc fish sauce, and nước mắm Phan Thiet or Phan Thiet fish sauce – About over twenty kilometers away from Hanoi Vietnam).